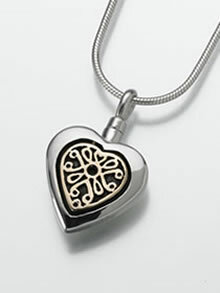 The Filigree Heart Keepsake is available in Sterling Silver with a Sterling Silver filigree insert and Sterling Silver with a 14K Gold filigree insert. To view the Sterling Silver with 14K Gold insert, click on the gray tab titled Detailed Images. The pendant measures 3/4" tall x 3/4" wide.